February 6, 2018 – Nashville, Tenn. – With reports of strong ticket sales on Jon Foreman’s upcoming solo tour, Aspiration Entertainment announced today the digital release of Jon’s new film 25 IN 24, as well as exclusive one-night world premiere viewing parties. 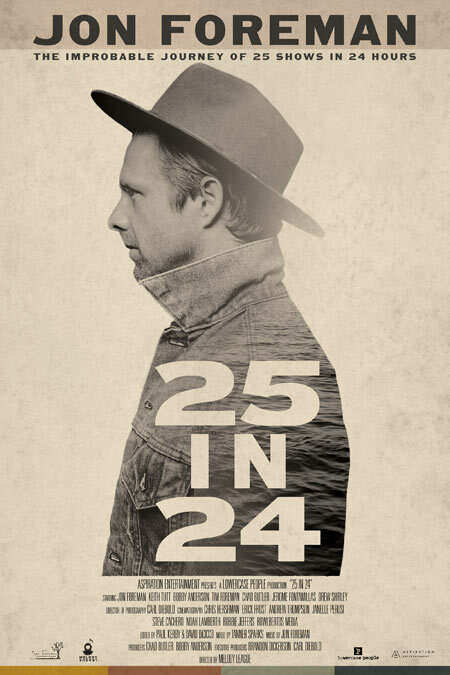 25 IN 24, which follows the SWITCHFOOT frontman on his journey playing 25 shows in 24 hours, will be available to rent or own via iTunes, Amazon Video, GooglePlay and other digital platforms on Tuesday, March 6, 2018. In advance of the digital release of the film, fans will have the opportunity to host a 25 IN 24 House Party on Saturday, February 24, in partnership with To Write Love on Her Arms, a non-profit movement dedicated to presenting hope and finding help for people struggling with depression, addiction, self-injury and suicide. The 25 IN 24 House Party offering provides an innovative and exclusive first-look of the film to fans worldwide. On February 24, fans will have 24 hours to stream the film in their homes as part of the film’s world premiere. The House Party package will be available for purchase starting Tuesday, February 6 on jonforeman.com, and if fans make their purchase by February 16, their name will be included in the end credits of the movie stream. At a price point of $14.99, the 25 IN 24 House Party package, which will be available for purchase at jonforeman.com, will include: access to early viewing of the film on Saturday, February 24; a digital EP which includes 5 new songs from Foreman; exclusive behind-the-scenes content; and digital assets for hosts to promote their house party, including response cards for viewers to share their own dreams too. For more info on how to host your own 25 IN 24 House Party, visit jonforeman.com. On October 24 at 10am, Jon Foreman and his friends embarked on a music journey throughout San Diego aiming to play 25 shows in 24 hours. With venues including a children's hospital, a wedding, and a Mexican restaurant, this 24-hour musical experience explores the polarity of everyday life, taking viewers to places that only music can go. Through his journey, Foreman discovers that the road less traveled is always worth the risk, and sometimes the only way to hold on is to let go. Foreman will then set off on his 25 IN 24 Tour beginning March 1, where he will perform live as an acoustic trio and screen the film for attendees. Tickets are now on sale and can be purchased at www.jonforeman.com. Aspiration is a social impact entertainment company, specializing in data-and-demand-driven distribution and marketing of specialty films, television, and media. The Nashville-based company is led by marketing executives with more than twenty years of media and entertainment experience, including the marketing, distribution, and production of over 100 studio films, indie films, and TV shows. Within the most cluttered marketplace in history, Aspiration provides a different approach to leverage proven marketing and distribution strategies with innovations that match the trends of audiences, technology, and society.